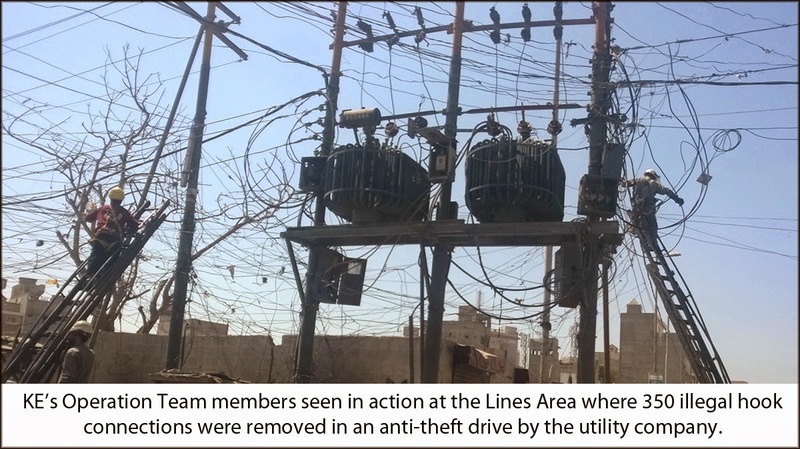 K-Electric took stern action against Kunda infestation in Lines Area where its team removed more than 350 illegal hook connections from the pole-mounted transformers (PMTs). In its press statement, KE said that such operations are difficult to conduct for the organization since they are often threatened by residents who stand to lose the most from a clean-up drive. KE said that similarly in this instance they faced resistance from the defaulters in the Lines Area, but despite the confrontation by the area people, all the illegal connections were removed due to the presence of police personnel as well as media. The press statement added that the telephone wires and other equipment used to set-up the hook connections were confiscated and taken into custody. It is pointed out that the consumers of 2 PMTs at Madina Road owed the utility company more than Rs. 30 million while payment of monthly bills in these areas had fallen to about 30 percent. The statement explained that apart from the heavy outstanding, Illegal Hook connections have increased the load on the PMTs and become a cause of tripping feeders and technical faults.